Gosh I can’t get that darn commercial out of my head, you know the one I’m talking about Cha, Cha, Cha, Chia! So with that stupid commercial in my head, I thought, hmmm, instead of trying to grow my own chia pet, why not just eat the seeds? No, I didn’t come up with today’s recipe because I was eating chia seeds, it’s just when I use chia seeds I think of that commercial. So yupperdoodles, today’s recipe is using the same chia seeds that you use to grow hair on an animal, person or Scooby Doo!! Silly stuff! Who came up with actually eating the seeds? My curiosity was peaked, what is up with all of these chia recipes? So I thought I would give one a try, chia pudding. Sounds strange doesn’t it? Well, I thought, why not give it a go! Maybe I will like it? Maybe it will change the world? Hmmm, chia pudding? This is the simplest pudding I ever made. Even more simple then instant pudding. I took two cups of coconut milk, add chia seeds, maple syrup and vanilla extract. Gave it a mix, cover it up and in the fridge it went. The pudding needs to sit for about 8 hours, so I went to bed! I woke up in the morning and sure enough, there staring back at me was my chia pudding. It was thick, kind of gel like, but pretty looking! Mixed it up and took a spoonful. You have to know I was a little afraid. Then my taste buds lite up! It tastes really good! The chia seeds took the flavors and called it its own. Wow! I’m impressed! This couldn’t be anymore easier to make and it’s got some great flavor going on. So I spooned my Vanilla Chia Seed Pudding and put it in a bowl and added some berries on top, because I need my berries. I love my breakfast! I really, really love it!! Wow, I am truly impressed!! Hmmmm, Cha, Cha, Cha, Chia for breakfast! 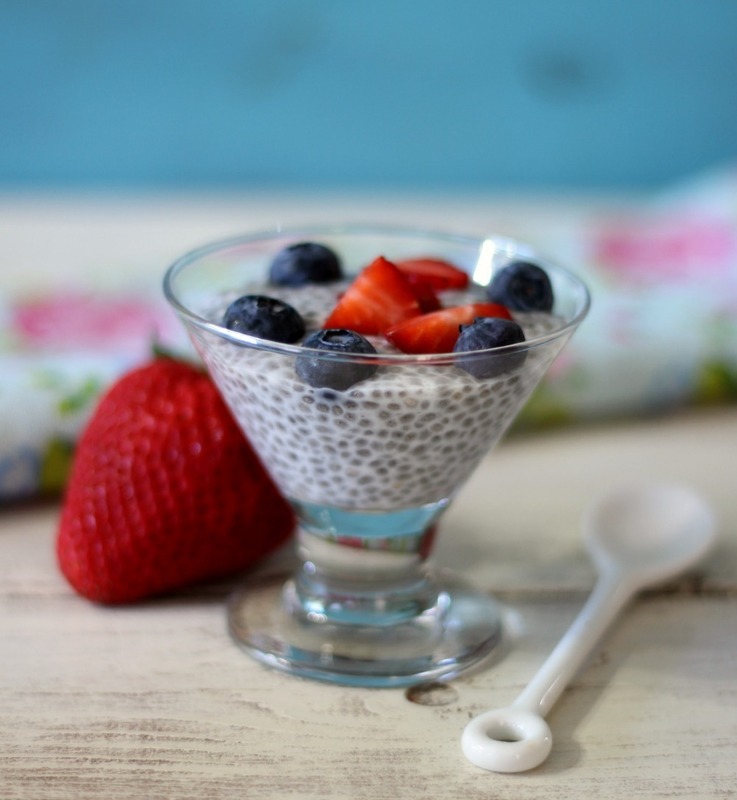 The texture of the chia seed pudding kind of reminds me of tapioca pudding, but better and healthier for you. It’s thick and has a tiny crunch from the seeds. It was also sweet and the vanilla flavor really stood out. Now that I made a basic recipe for Chia Pudding, I can make new recipes and change it up. The possibilities are endless. I am so excited to expand out into the Chia Pudding world!! A healthy, vegan. gluten free vanilla flavored pudding made with chia seeds, coconut milk and maple syrup. Topped with blueberries and strawberries. In a bowl, add milk, chia seeds, maple syrup and vanilla extract. Whisk together. Cover and refidgerate over night. 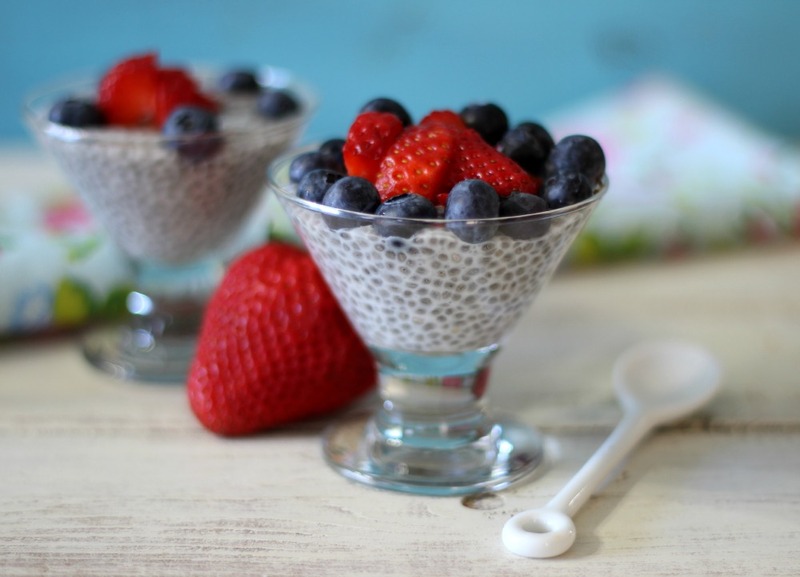 Divide the chia pudding between four bowls and top with fruit. 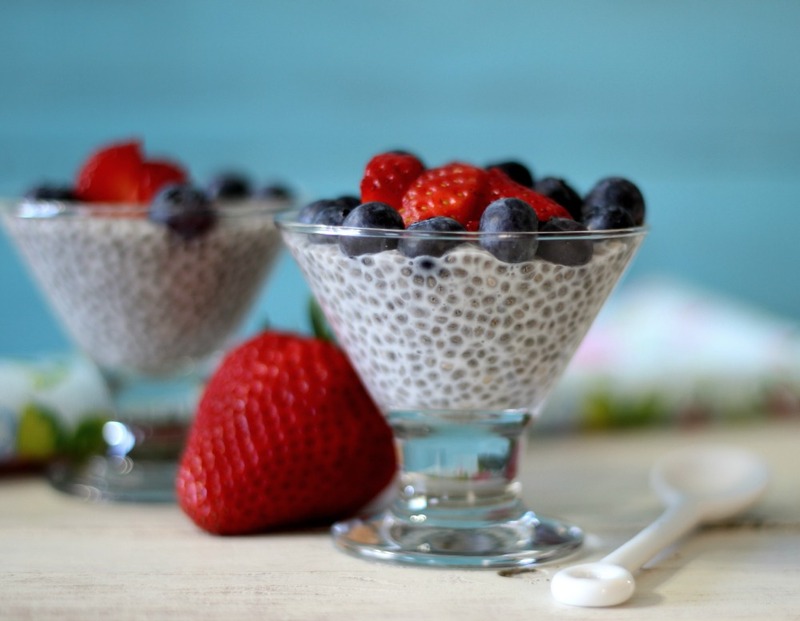 The chia pudding will last up to 4 days in the refrigerator. So why Chia Seeds? They are super-duper healthy for you! They contain omega 3’s, calcium, protein, fiber and this breakfast will fill you for hours. These little seeds are a super food for good reason, and the best part is that they are super tasting. 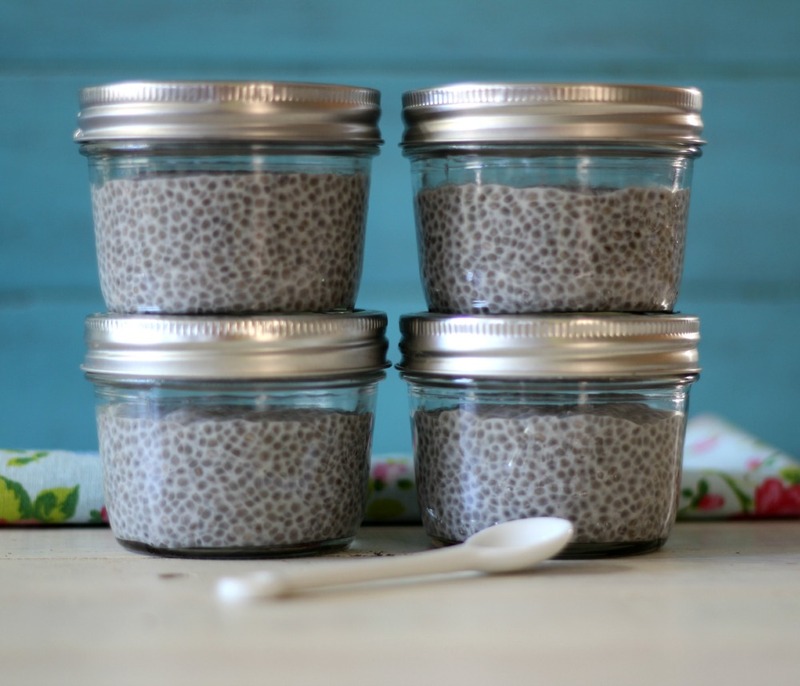 I loved it so much, I filled my little mason jars with the Chia Seed Pudding and now will have it for breakfast for 4 days. I will just top with my berries! I don’t think my breakfast could get anymore healthy. Oh did you catch how much fiber 2/3 cups have? 9! That is awesome!! Now I will be filled till lunch and no snacking!! Well my Friends, give this little pudding a try! I promise you won’t be disappointed! Have a great day! Cha, Cha, Cha, Chia style! Love this recipe! Thank you for another good one, I love breakfast and this sounds filling and healthy. Love vanilla, but can’t wait for you to come up with other flavors for us!! Thanks Nancy! I am looking forward to branching out on other Chia Pudding flavors. LOVE it Jennifer! 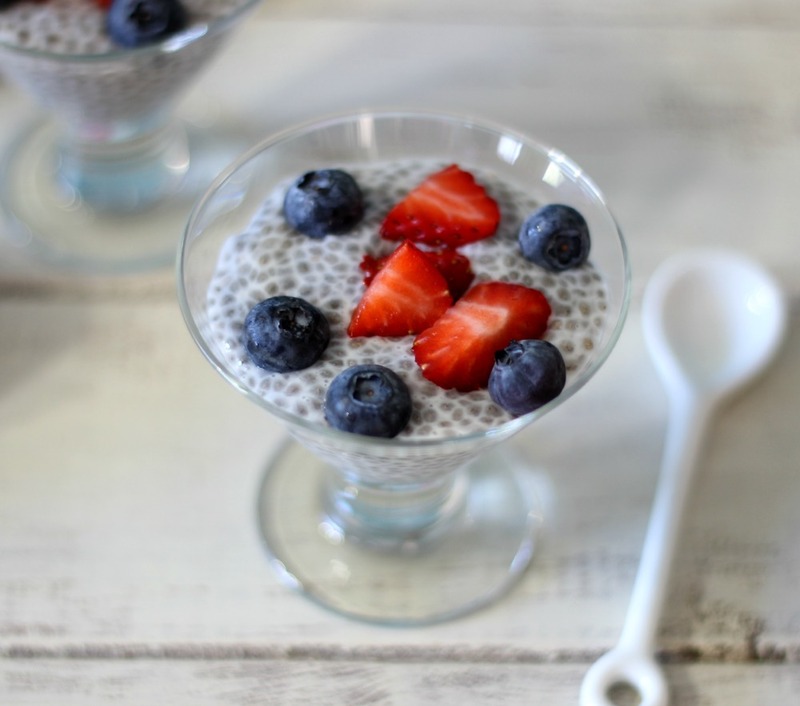 I am gonna try and branch out into the chia pudding soon too! And chia jam! Thanks for this lovely recipe! I love Chia Jam and plan on sharing a recipe soon on my blog. I just started getting back into Chia Seeds and I just love them. Love how healthy this is – such few ingredients and looks delish. Beautiful pics too! Ahhh, thank you so much Chanie! I would need at least two cups of this! Everytime I see chia seeds I always get that commercial stuck in my head too…and now it happened again! LOL. Yummm your pudding looks so great!! I made your pudding last night, but when I got up this morning, it was not gel like. The seeds had barely swollen up. Is there something extra I should do? Hmmmm, It’s 3 tbsp of chia seeds per 1 cup of liquid. Just add about a tablespoon more chia seeds, mix it up and place black in the refrigerator. It will thicken up, and it shouldn’t take to long. Wow this looks so pretty. I have never though of having pudding like this. I would love for you to share at Bacon Time, if you haven’t joined the linky yet. Have a great weekend. Thank you so much for the invite Mindie! Giada DeLaurentas has a chia seed pudding recipie similar to yours but she adds Greek yogurt to the milk mixture. It’s super yummy and has the added protien and probiotics. I just about have this for breakfast everyday. 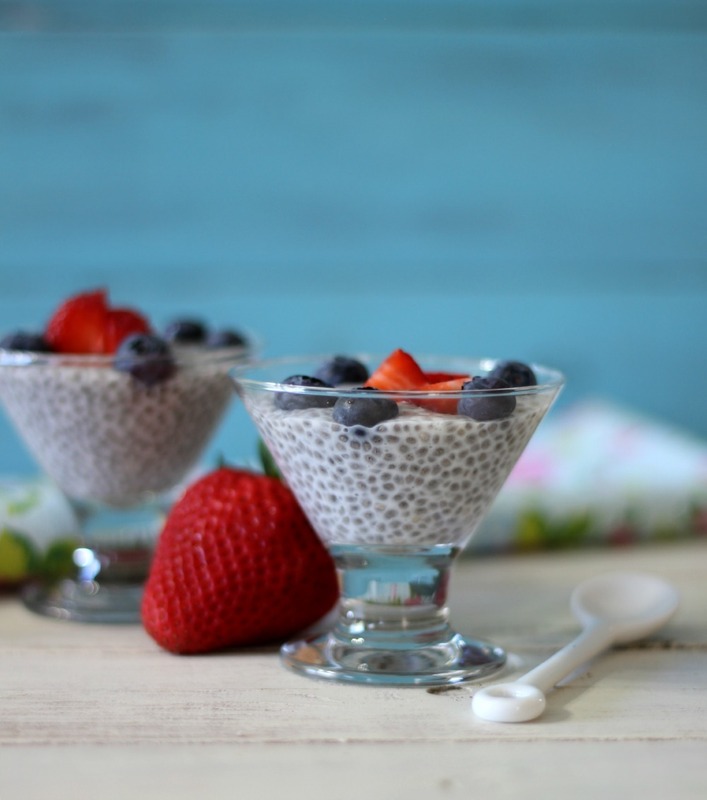 I love the idea of using greek yogurt in chia pudding! I am so going to try that next time. Thank you so much for letting me know! 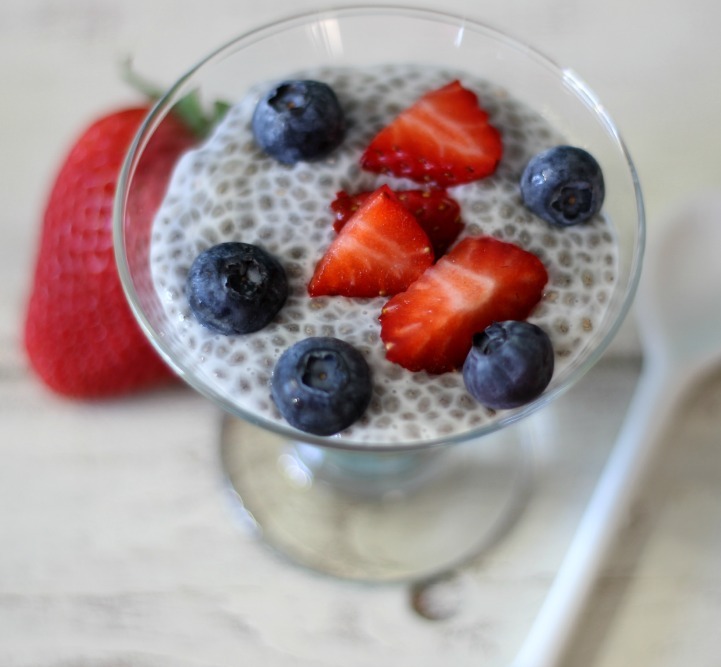 I have tried chia pudding before and I love it! My favorite flavor is chocolate banana. Just mix in 1 Tablespoon of good cocoa powder to the pudding and when you are ready to eat it slice 1/2 of a banana on top! delicious! Chia pudding is so good, isn’t it? Love it with granola! It’s a unique pudding, but so good for breakfast or snack.